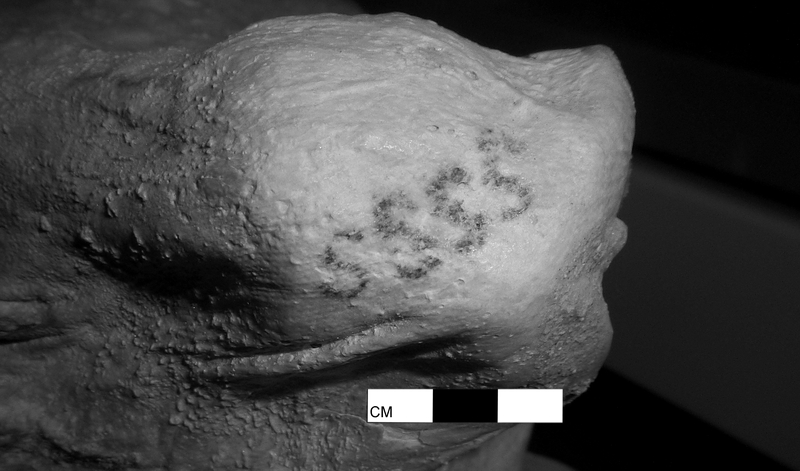 Ötzi the Iceman has competition for the world’s oldest tattoos from two pre-dynastic Egyptian mummies in the British Museum. Gebelein Man A and Gebelein Woman are two of six mummies unearthed in 1896 by British Museum Egyptologist Wallis Budge from their shallow sandy graves near modern-day Naga el-Gherira in southern Egypt. 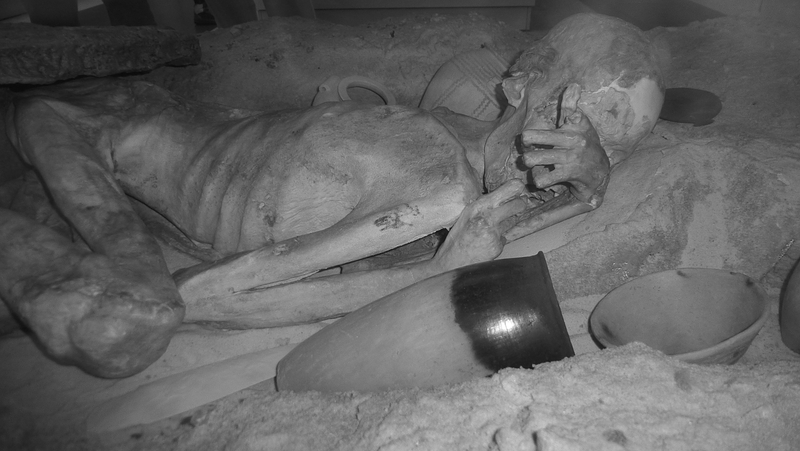 Covered in warm desert sand at the time of their burial, the six natural mummies were very well-preserved and the first complete predynastic bodies ever found. They were acquired by the British Museum in 1900. 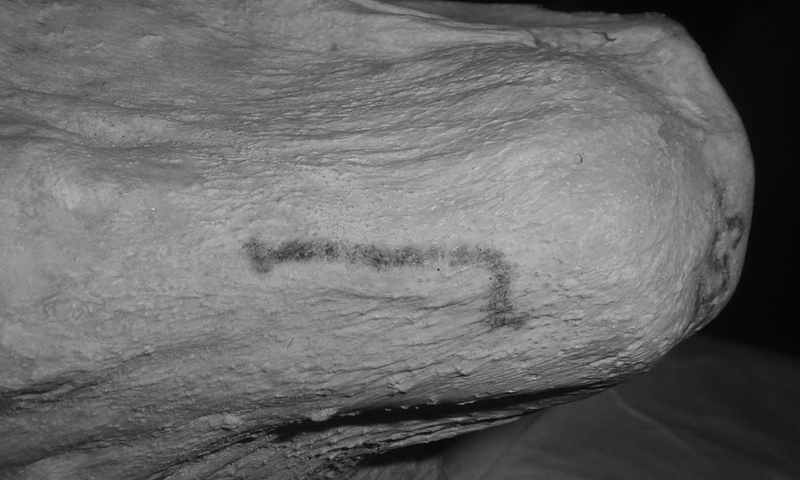 They’ve been on display for more than a century, but nobody realized Gebelein Man A and Gebelein Woman had tattoos until a recent infrared examination. All that’s visible to the naked eye on Gebelein Man is a faint smudge on his upper right arm. 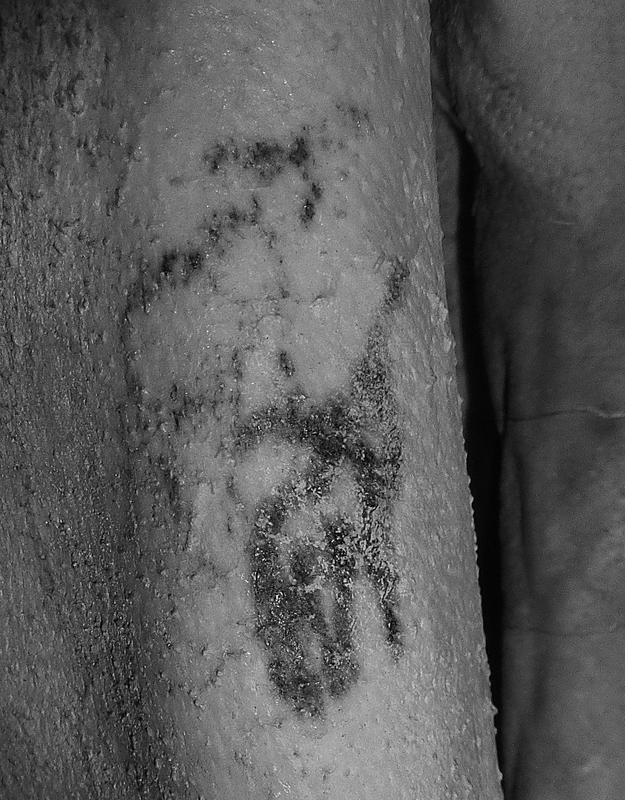 Infrared photography revealed the smudge is actually a tattoo, and a figural one at that. It depicts two horned animals, one with a long tail and elaborate horns identifying it as a wild bull, the other with the curving horns and a shoulder hump characteristic of a Barbary sheep. The iconographic references are recognizable because they come up regularly in the art of Predynastic Egypt. This is just the first time they’ve come up in body art. The animal figures are thought to symbolize strength, still today an immensely popular motif in tattoo art. Gebelein Woman’s tattoos at first glance do not appear to be figural. IR revealed the presence of four S-shaped figures running over her right shoulder and a bent line a little further down her right arm. Again, both of these motifs are found on predynastic painted pottery. However, the linear piece may not be an abstract design. It is similar to objects held in the hands of figures believed to be participating in religious rituals. Researchers think they may be clappers used in ceremonial dance. It could also be a staff symbolizing her holding high office. It’s possible they and the s shapes served a spiritual function on her body as well, marking her as a woman of status, advanced cult knowledge or singling her out for protection. Dating to between 3351 and 3017 B.C. (Ötzi died around 5,300 years ago, so the Iceman and the sand people are roughly the same age when accounting for margins of error), the Gebelein mummies can each claim new records in the history of tattooing. Gebelein Man has the earliest figural art; Gebelein Woman is the oldest known tattooed woman in the world. Ötzi’s tattoos are patterns of dots and lines. The results of the study have been published in the latest issue of the Journal of Archaeological Science, but the issue is in progress and the article is not yet available online. An antiques dealer has discovered the yearly income records for the Duchy of Cornwall under King Richard III in a box of 1930s royal memorabilia he acquired as a single lot in an estate sale. The compotus rolls, the accounts of the monarchical estates in the Duchy of Cornwall under King Richard III (and for a brief window nominally under his nephew Edward V who was never crowned and whom Richard deposed two months after his ascension), were drawn up for Richard after he took the throne and covered the period from Michaelmas (September 29) 1482 until Michaelmas 1483. Written in Latin on 11 thin parchment membranes by a scribe with an elegant hand for calligraphy initials, the rolls record that profits were handsome in the Duchy of Cornwall in 1483. The annual income from the Cornish manors, burghs, courts and tin mines, plus a handful of Devon manors totalled around £500. A labourer made about £2 a year. The accounts show detailed showing totals for rents, sales and court receipts for manors within the Duchy and in Devon. Also detailed are the names of bailiffs who supervised work on the each manor and would act as a link between the serfs and their feudal lord. The amounts raised from each manorial lord amounted to between £12 and £30 per annum. 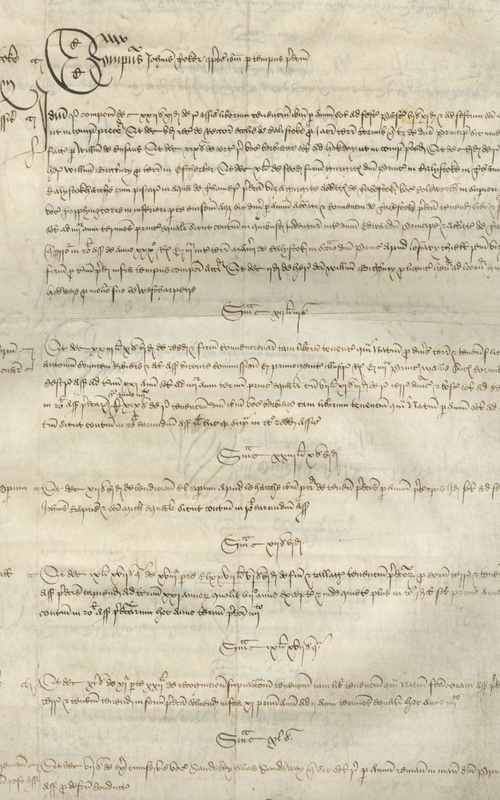 Overall, the Duchy of Cornwall’s seigneurial records have survived unusually well, retained for generations by manorial archives, county archives and by duchy management. Today almost all of the accounts between 1300 and 1500 and beyond can be found in the county Public Records and the Duchy of Cornwall Office. This scroll is one of only a handful to survive in private hands. The owner didn’t know exactly what was now in his private hands until a medieval manuscripts expert from Bonhams examined the parchment. He has now put it up for auction in Bonhams upcoming Fine Books and Manuscripts auction on March 21st in London. The pre-sale estimate is $5,500 – 8,300. 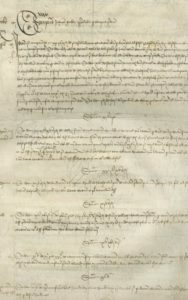 Peter Hammond, president of the Richard III society, said: “It is a very important record and we don’t know how many of these 15th century documents still exist. Historian hope the document will remain in Britain following the sale and be made available for public research.